The seven drawers provide lots of space for stockings, underwear, scarves, etc. Large door on left reveals generous 10 x 15 shelves for sweaters, blankets and other bulky items. 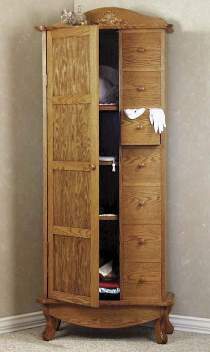 Measures 70"H x 29"W x 13"D. Order hardware parts package separately or see Special Offer.Chifforobe Hardware Parts Package Includes non-mortise hinges, shelf supports, magnetic catches, oak knobs and embossed oak ornament. Project plan, wood, and wood finish are not included.